Fr John O’Mahony SMA passed away on Wednesday 12 November 2008 at St Theresa’s Nursing Unit attached to SMA House, Blackrock Road, Cork. Though he had been in failing health for some time his death was unexpected. He was aged 71 years. John was born on 19 June 1937 in Glasnevin, Dublin in the Archdiocese of Dublin, one of the three children of Bartholemew and Eileen (nee McDonagh). He received his secondary education at St Vincent’s CBS, Glasnevin 1952-1956. Following his Leaving Certificate he joined the Society of African Missions and entered the Spirtitual Year programme of the SMA at Cloughballymore, Kilcolgan, Co Galway 1956-57. He became a temporary member of the Society of African Missions on 25 June 1957. In 1957 he began his studies of philosophy and theology in preparation for missionary priesthood with the SMA at Dromantine, Newry, Co Down. He was ordained priest at St Colman’s Cathdral, Newry, Co Down by Bishop Eugene O’Doherty on 21 December 1962. 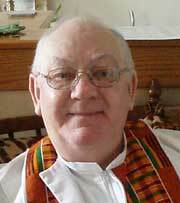 For his missionary work Fr John was appointed to the Archdiocese of Kaduna in Nigeria. He was assigned to establish and set up a Media Centre in Kaduna. He foresaw the need to complement the work of missionaries in their stations with radio programmes that could be broadcast to the villages and towns all over northern Nigeria. This was to have a profound influence in the work of evangelisation. From 1963 to 1991 he oversaw the development of the Media Service Centre. This Centre was responsible for the training of over 2,000 Nigerians in the use of the media and produced some 200 catholic religious radio prorgammes each year as well as many publications in the Hausa language including the lectionary of Mass readings, hymn-books and calendars. He handed over the Directorship of the Centre in 1989 to local priest Fr Martin Dama but continued to take an active part in the work. He availed of a sabbatical to study in Rome and Jerusalem in 1987. He was frequently in demand to use his media skills at seminars and was on the SMA commision for the better use of the media in the service of evangelisation. He was elected Vice-Regional Superior for the Nigeria North Region in 1991 and was based at Kagoro in Jos Diocese. Due to ill-health he returned to Ireland in 1992 and had a prolonged convalescence at home and in SMA House until 1994. In 1994 he was appointed Rector of the newly-established SMA House of Formation in Nairobi, Kenya. However the following year he was forced to return again to Ireland for medical treatment for a brain tumour and convalescence again in Maynooth until 1998. He then spent a short time on pastoral assignment in Elphin Diocese. But his recurring medical condition and further medical treatment necessitated his retirement to SMA House, Claregalway. He continued to supply from there in the Archdiocese of Tuam until 2007 when he was transferred to SMA House, Blackrock Road, Cork. Fr John’s remains were reposing at SMA House Oratory, Blackrock Raod, Cork from Wednesday evening and removed to St Joseph’s SMA Parish Church for the Funeral Mass on Friday, 14 November at 11.00 a.m. Forty-one priests concelebrated the Mass. Fr Fachtna O’Driscoll SMA Provincial Leader was the main concelebrant and he was joined at the altar by Fr Seán Lynch SMA and Gerry Murray SMA, Fr John’ classmates. Brother Jim Redmond SMA was at the organ and Fr Angelo Lafferty SMA led the singing. Following the Mass the remains were interred in the SMA Community Cemetery, Wilton, Cork. He is sadly mourned by his older sister, Mary, and his twin brother, Frank, nephew and nieces and other relatives and a wide circle of friends.